Christmas time just would not be the same without glittering ornaments and twinkling lights. Here are some enchanting and simple ways to add warmth and magic to your fireplace, dinner table and home. 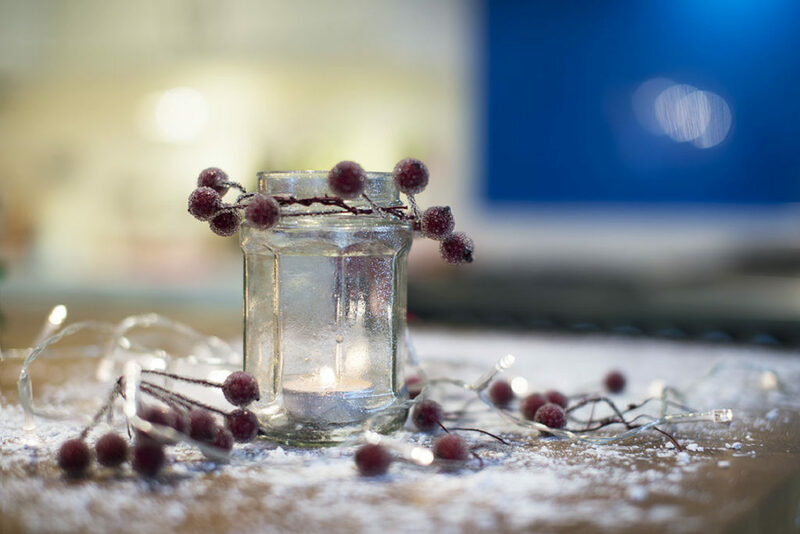 For a seasonal table centre piece or fireplace feature, take a few jam jars and add mini baubles and fairy lights. Lids on or off, it’s up to you. Stay within your chosen colour scheme by spray painting the lids first or add a ribbon around the jar. Hide the battery pack in between baubles. This works very well for window displays too. Combine the soft glow of mini lights with the gentle scent of warm pot pourri by bundling up a string of lights and your favourite pot pourri in a vase, bowl or a few jam jars. For a little bit of tradition, place some holly and fake snow in the bottom of a jar and add a battery operated tea light. Or spray, stencil a design on the jar and place your tea light inside. Perfect to add soft festive lighting to the dinner table. Want to customise and jazz up your wreath? Arrange battery operated lights around a wreath and hang on a door or wall (if you use these lights however don’t hang your wreath outside – these lights are for indoor use only). Pine cones with white frosted tips will come to life with bright fairy lights. If art and craft is your thing, why not pick up some fallen pine cones and decorate them in your own unique design and colours.